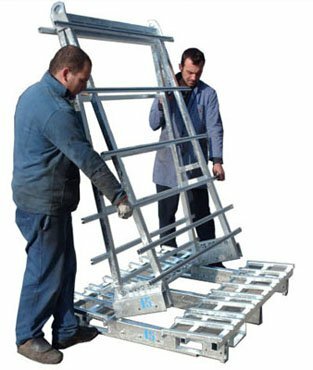 Double purpose model: it can be used to handle and transport glass panels to yards with bridge crane (through hooks) and lift truck forks (from the front and from the side). You can use it as a trolley if you insert 4 wheels into special devices for extractable wheels. Loading bases and shoulders are equipped with "C" iron channels, protected with PVC profiles. Total lifting capacity Kg. 1500 (with safety coefficient 1:4 imposed by CE Norms) certificated and marked CE norms (Machine Directive 2006/42/CE once 98/37/CEE – DPR 459/96), delivered with "Manual for Use and maintenance", Certificate of compliance and Testing Report – Tested with 5000 kg. (as documented on our "Testing report for A5 Rack"). With or without seats for extractable wheels. Painted: Green RAL 6011 or Blue RAL 5017 or Hot galvanized. On request we weld slotted profiles for the housing of safety bars. 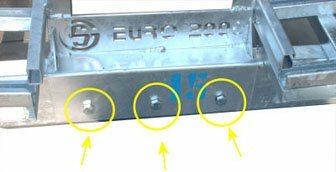 For a minimum purchase of 8 racks we can personalize racks by welding on both sides n.2 iron plates with the name of the customer carved through laser. On request we supply the device for insertion of lift truck forks and manual lifter in the short side of the rack. LOADING dimensions: two bases of 290 x 1500 x h. 1700 mm. LOADING dimensions: two bases of 340 x 1500 x h. 1700 mm. LOADING dimensions: two bases of 390 x 1500 x h. 1700 mm. TOTAL LIFTING CAPACITY 1.500 KG. solid and safe as the welded model.